Thousands of senior citizens sporting black bands around their arms and shouting slogans like "we want our respect" or "shame (on the government)" staged a protest at Azad Maidan, Mumbai and various other parts of the state and the country yesterday. They wanted better health insurance schemes from the government, immediate implementation of the National Policy on Older Persons (NPOP) and the Maintenance and Welfare of Parents and Senior Citizens Act (MWPSCA). "We are a huge part of the government and we have been neglected by the very same government. No promises have been kept," said RS Desai, member of the All-India Bank Retirees Federation. 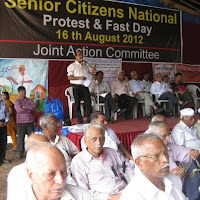 "After 64 years of tolerating the government that has closed its eyes to the problems faced by senior citizens and particularly after 11 years of waiting for the NPOP to be implemented, we are gathered here to convey our strong protest," said Dr Sheilu Sreenivasan, founder-president, Dignity Foundation. This protest was part of an all India 'Senior Citizens National Protest Day', observed in various cities, towns and villages. The core of the protest was to demand health insurance for all senior citizens - with or without any pre-existing disease, immediate implementation of the NPOP, MWPSCA and the Indira Gandhi National Old Age Pension Scheme (IGNOAPS), which would give senior citizens Rs500 as monthly pension. The protest wanted these facilities to be grated to all Below Poverty Line (BPL) senior citizens, and residents of old age homes. Protestors also called for the setting up of an exclusive ministry and a national commission for senior citizens. "In our country, there are 60 million people who live below or barely above the BPL (mark). They are those who earn Rs56 a day or Rs1,700 per month. And out of these 60 million people, only 10 million receive Rs400 per month under the IGNOAPS plus 10kg of grains per month under the Annapurna Scheme. (But) all of these platitudes remain only on paper and have yet to be implemented," said Dr Sreenivasan. Panellists at the protest meet said that the NPOP has been neglected by the state and the Central governments and the bureaucratic system has been tardy, leading to its non-implementation. About 28 states and seven Union Territories have yet to adopt the NPOP even after 11 years of its promulgation by the Union government. "The core problem is that for years they have been passing the buck, from the Central government to the finance minister to the state government. We need some action, we need our respect," said KS Samant, general secretary of the General Insurance Pensioners Association (GIPA). In the case of MWPSCA, even after its enactment three years ago, the scheme has not yet been implemented. According to Amruta Lovekar, senior project manager of Shree Ramanugrah Trust, there is still a need for policies which give senior citizens care and protection and better mental health treatment. Families that look after their parents must get tax exemption, she demanded. Mr Desai added that even former bank and insurance company employees have been neglected by the government and were fighting to get privileges. Subhash Desai, a Shiv Sena MLA, assured senior citizens that he would bring up the matter before Parliament. According to Sailesh Mishra, founder-president of Silver Innings, the protest had gathered huge amount of support among elected representatives. After the event, Mr Mishra told Moneylife that ministers in Madhya Pradesh have given some assurance to the committee that they would look into the various issues involving senior citizens. A memorandum with various demands from senior citizens was submitted to the government of Maharashtra. State minister of social justice, Sachin Ahir, received the memorandum on behalf of the Maharashtra government. Late yesterday Mr Mishra sent Moneylife an SMS saying "Victory. Met Sachin Ahir, state minister for social justice. He in principle agreed to most demands. Asked to meet again in a week." Mr Ahir was visited by Mr Mishra, Mr Samant, Dr SP Kinjawadekar (president of the All India Senior Citizens' Confederation) and Vijay Aundhe, (general secretary of the Federation of Senior Citizens Organisations, Maharashtra). The protest was supported by 27 national, state and local level organisations, NGOs, associations of banks/insurance companies and retired employees.